British men's tennis is no longer confined to Andy Murray. English player Dan Evans exited the US Open after a battling display against Spanish seed Tommy Robredo, with his reputation greatly enhanced. At stake was a fourth-round match against Roger Federer. In a hard-fought fourth set, Evans briefly suggested he could go all the way and had two set points to level the match, but Robredo's experience eventually prevailed. Evans now heads for Britain's Davis Cup tie against Croatia with his confidence and bank account greatly boosted. Evans came through qualifiers at Flushing Meadows, beat seed Kei Nishikori in the first round and Australian prodigy Bernard Tomic in the second. Evans previously lost his LTA funding because of his casual attitude, but his new-found seriousness is reaping dividends. At the same time in 2012 Evans was beaten in the semi-final of a minor event in Wrexham, picking up £300 for his participation. His US Open exploits netted him £61,000 and will take him into the world's top 150. 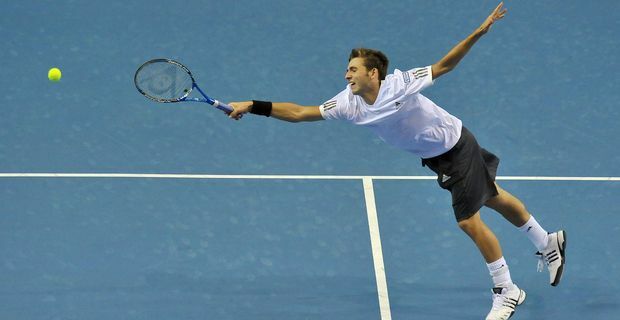 Evans's part in Britain's Davis Cup win over Russia in April had inspired him to raise his game and realise his potential. The test will be building on what he achieved in New York. The next target is coming through qualifying for the Australian Open. "That would be good," Evans said. "I think a lot of the guys here have been impressed by what I have done. It's a good stepping stone - but I still have a long way to go to be in the top 100. I can go away with different targets. It has changed my mindset quite a lot." Murray, meanwhile, remains on course to defend the first grand slam title he won in 2012. He faces Florian Mayer in the fourth round. Murray says the German has a repertoire of "pretty funky shots".